Should you invest in commercial signs? If you have a business, you are going to need signs at some point in time. It is a fact. Whether you are taking part in a trade show, or you want to advertise, signs are a literal free plug for your company. When done right, your signs can help you to garner more customer interest and better sales. But do it wrong and you will have potential customers walking away confused. This is why it is crucial to find the right commercial sign company. Why should you invest in some good quality commercial signs for your company? Besides the reasons mentioned previously, signs are also professional. When you are looking for a place to eat, driving down a road, what do you look for? Signs. When you are looking for a store in the mall, what do you read? Signs. Signs are important to a business; not only are they a prime marketing tool, but they can also help your consumers learn more about your company. The less cluttered a sign is, and the more information it gives about your company, the more chances it is going to catch someone’s eye. Once it had done that, you wind up with a potential sale. 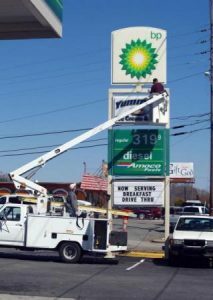 If you are in the market for a commercial sign company, there are a few things you should look for. The first and most obvious is company history. You want to see what brands the company has created signs for. You also want to see real samples of these signs, not just ones that the company itself provides. So you should ask; what signs has the company done? Then, do your own research. Contact the companies and see what their satisfaction rating was with the sign. Ask about the quality, and while you should not mention the price, you should ask whether or not they believe that the sign price was justified by the quality. Remember, a sign may be your potential customer’s only possible link to your company. As such, if you get it wrong the first time, you may not have a second time to make it up. Remember; your sign should represent your company. If you do not feel that a business you hired is making the sign properly, or that it does not have the proper means to do the job right, then looking elsewhere should be your first, immediate choice.